In Arkham Horror: The Card Game, you and your friends can brave the many terrors of cities plagued by cultists, grotesque beings, portals to other worlds, and dimensions completely incomprehensible to human experience. An unholy and effective marriage of the traditional customizable card gaming and roleplaying experiences, the Arkham LCG® works on many levels to anchor you in your investigator's shoes, peel open your eyes, and force you to witness the madness taking place all around you—madness which few people can uncover, much less survive. 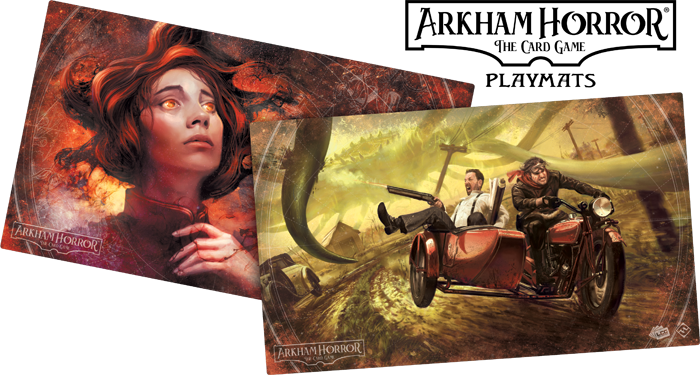 While you may certainly utilize these new Arkham-themed playmats as an evocative play surface for any Arkham Horror Files game, there are a couple elements that align them all with Arkham Horror: The Card Game (and with each other). First, they all feature some of the Living Card Game's beautiful and atmospheric artwork. These are pieces that will constantly remind you that your life is in peril, and they'll do so in such a way that you won't quite be sure what it is that threatens you. 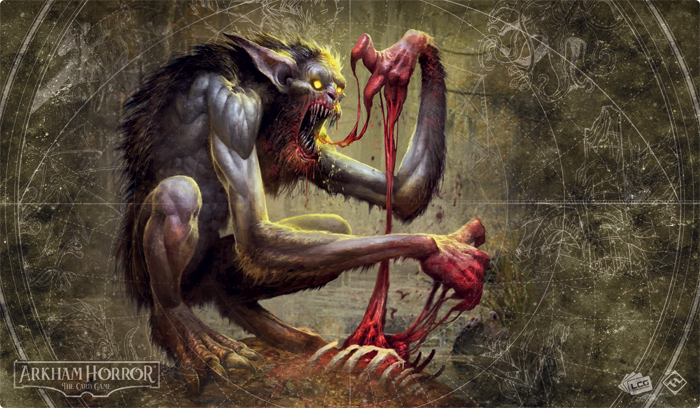 What is the strange creature in the Bloodlust piece, and what is it eating? How did the many-eyed horror of the Altered Beast playmat come into existence, and how is its existence even feasible? 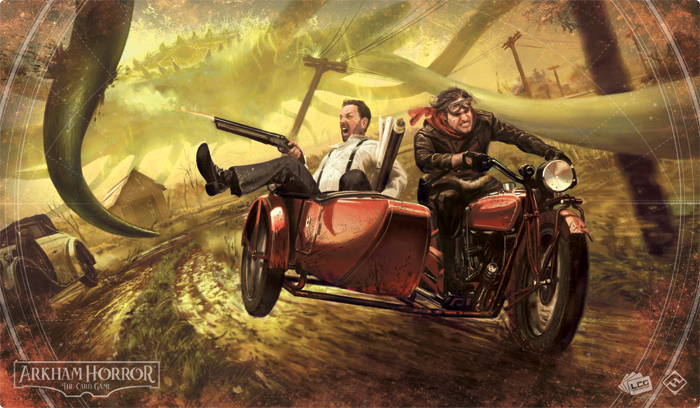 Do the men in the Narrow Escape artpiece honestly have a shot at escaping, or is the "escape" in the title merely the denial of a reality we cannot fathom? Second, all these playmats feature an intricate zodiac that connects them to the astrological pattern traced across the back of each Arkham LCG player card. If the artwork isn't enough to convince you that you're doomed, perhaps you'll be able to read your fate in the alignment of the stars. Or perhaps you'll see this arcane framework as the outer edge of a portal through which you can peer into another world. 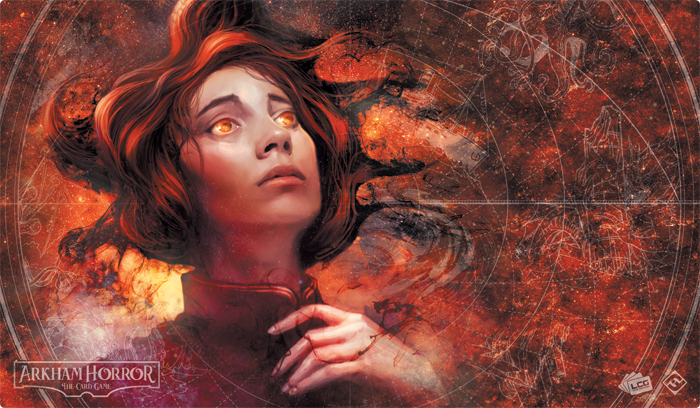 You might stare into the eyes of the woman depicted on the Across Space and Time playmat and find yourself wondering what she sees. You might consider the circular framework the zodiac presents, and you'll be nearly close enough to reach through that gateway yourself. Not yet driven to madness and despair by all that you've witnessed? Great! Then you just might have what it takes to begin your investigations! Even so, the world of Arkham Horror: The Card Game is so full of arcane secrets, hidden cultists, and occult magic that even the most intrepid investigators are likely to falter—unless they band together. As a cooperative LCG, the Arkham LCG allows you to conduct your investigations with up to three of your friends, and if you wish, you can do so atop the most iconic of all Arkham-themed playmats. The Countless Terrors playmat measures 26" by 26", large enough for up to four players, to confront all the horrors that await them, and it thrusts them into the spirit of the game by setting those games atop the stunning Core Set cover art by Ignacio Bazán Lazcano. 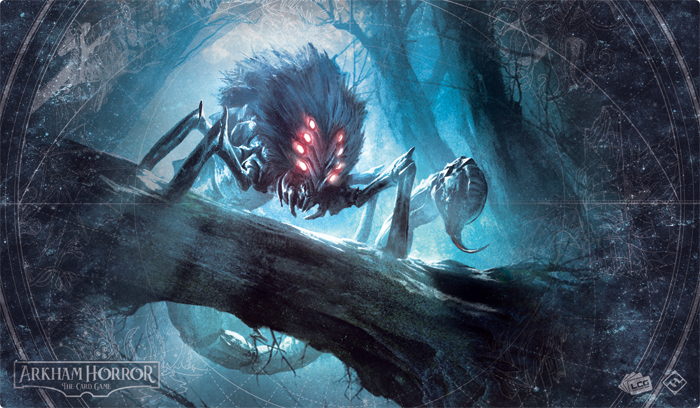 Not only does the Countless Terrors playmat feature the artpiece most closely associated with the many horrific struggles of Arkham LCG, but it circumscribes the piece within the largest and most terrifying zodiac of all five playmats, one in which you can begin to grasp the true menace of the tentacled terrors from the stars. Face Your Doom. Fight Your Doom! 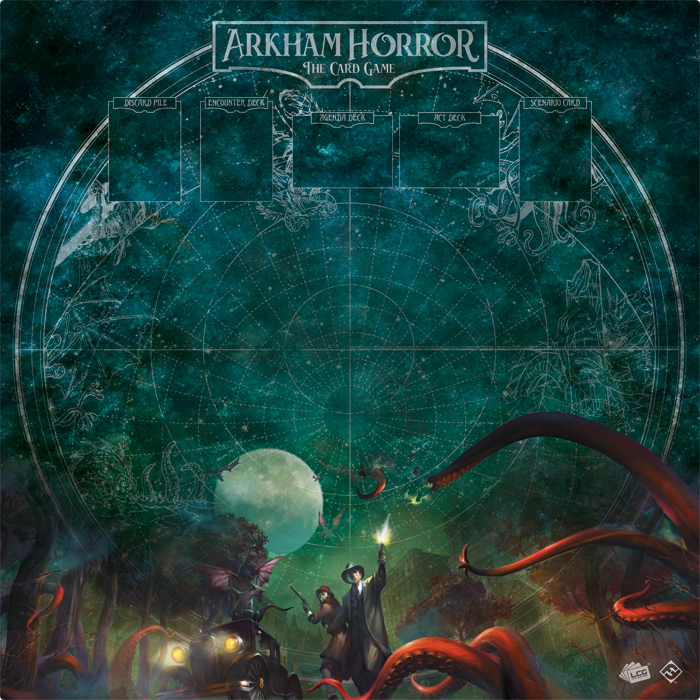 Whether you investigate the recent slate of disappearances in Arkham as an investigator in Arkham Horror: The Card Game, resist the Ancient One's forces in Elder Sign, or fight Deep Ones with a shotgun in Call of Cthulhu: The Card Game, these five new Arkham-themed playmats will remind you of your mortality in the most wonderfully evocative fashion. …But if you're a fan of the Arkham Horror Files universe and its many games, this reminder of your mortality isn't cause for despair. While those around you go about their lives blissfully ignorant of the Ancient Ones and the threat they pose, you are driven to action. These Arkham-themed playmats don't cause you to weep, wail, and gnash your teeth; they remind you of all that's at stake. So order one or more of these playmats today, and muster your strength for the desperate fight for humanity's survival!